I had no idea that anybody else who was proud of their country was only imitating American patriotism. Here at SFL nothing says “Happy 4th!” like an hour-long sermon on patriotism that starts with a harmonica solo and then just gets weird. 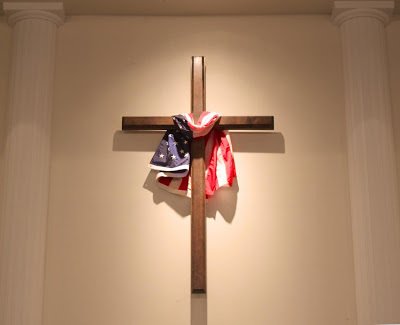 Fundamentalists love America for it is the land of freedom; the land of Washington the Baptist; the land that flows with Milky Ways and honey mustard sauce. Yet, Fundamentalists hate America too for it is the land of gay marriage; the land of Madonna and the pelvis of Elvis; the land of public schools and open bars. With fundamentalists love is always conditional and these United States just aren’t fit to be loved anymore. So instead, of loving the country as it is or as it could be fundamentalists set about to love it as it never was or as they hope it will someday be. They love the romantic myth of a country made with hands, prepared by their ancestors where every jot and tittle of the fundamentalists code is kept. It’s a place where flags are never burned, gays are always burned and a counsel of Baptist pastors has just re-written the Bill of Rights to read “Christians have no rights. Non-Christians have even less than that.” In this beautiful city on a hill everybody shows the joy of Jesus on their face, or else. In this land everything is banned for our own good. Liquor is no longer. Drugs, infidelity and children throwing tantrums at Denny’s all now receive the death penalty. Women are keepers at home, dreaming of the day when they may have a career as church secretary serving under a popular pastor. Children are taught 1611 English in schools and Congress has just passed a law mandating that Saviour must be spelled with a ‘u’. From sea to shining sea there are white picket fences surrounding white houses full of white people with the sound of hymns drifting from every radio. Now there’s an America that a fundy could love. God forbid. It’s that time of year again when we take some time and give thanks that we’re still God’s favorite country. I nominate this song for the Least Musical Lyrics Ever award. The Jack Hyles voice over starting at 1:55 is classic. i think the three who disliked better watch there backs i feel sorry for them cause they have to look over there shoulders everyday bu thank GOD for MAN OF﻿ GOD LIKE DR.JACK HYLES who stood up for GOD and whats right.